It's hard not to see the urban/rural divide in the United States--unless you just don't look. 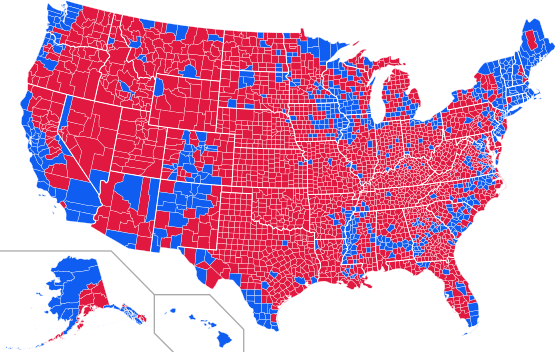 Perhaps the most iconic image representing that divide is a map of presidential election results by county. The map below is from 2012. Most of the land area of the United States represents Republican territory. But, of course, dense urban areas taking up much less land, but having far more voters per square mile, proved decisive for the incumbant Democratic presidential candidate, Barack Obama. It might seem that this is merely a cultural divide, hicks versus city slickers. But it is also an economic divide. Rural areas have been pummeled economically by the globalizing economy. That economy rewards the innovations and technology invented and deployed in cities more than the commodities that come out of the countryside. Hidden beneath these cultural and economic factors is an energy imbalance that Howard Odum, the great pioneer in understanding energy flows in nature and society, first identified in his work on what he called transformities. For fail-dangerous systems, we believe that failure is either unlikely or that the redundancy that we've build into the system will be sufficient to avert failure or at least minimize damage. Hence, the large amount of money spent on airline safety. This all seems very rational.